- Numbers 27, 47, 93, 111, 130, and 131 on my life list. My alarm went off just after sunrise; my goal of seeing the sun rise over the canyon ruined by not adjusting for the different time zone. We got up anyway, unpacked our food onto the picnic table, and made breakfast burritos over camp stoves. 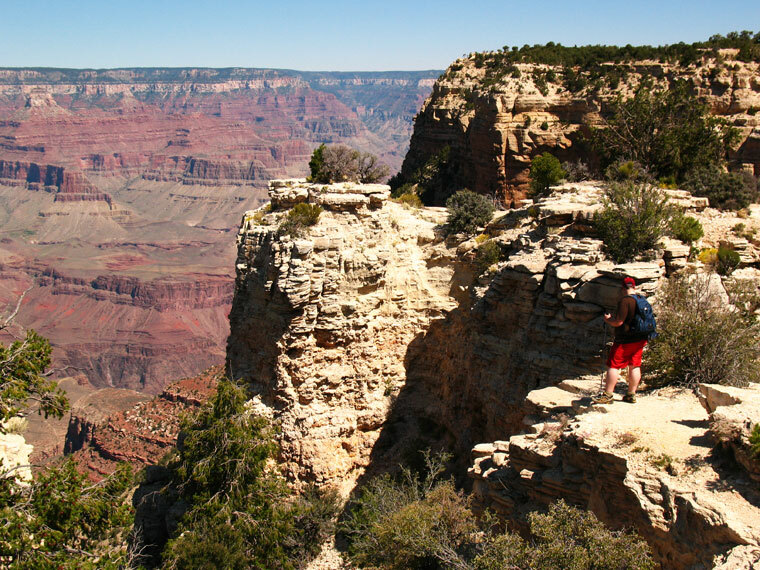 “I think seeing the Grand Canyon is kind of like seeing a famous actress, who you’ve only seen on screen, and realizing they are much better looking in person,” I said. “I saw that old white haired dude from Jurassic Park in person,” Randy replied. “Was he hotter in perso…?” “No.” he said straight-faced and without hesitation. We finished our breakfast and hiked a half mile down the Bright Angel Trail. I badly wanted to continue hiking until reaching the inner gorge but didn’t prepare for that, it’s a two day trip. We only had the day, so we only planned to hike the South Rim Trail. The mostly paved trail was hardly demanding but the constant view made up for it. 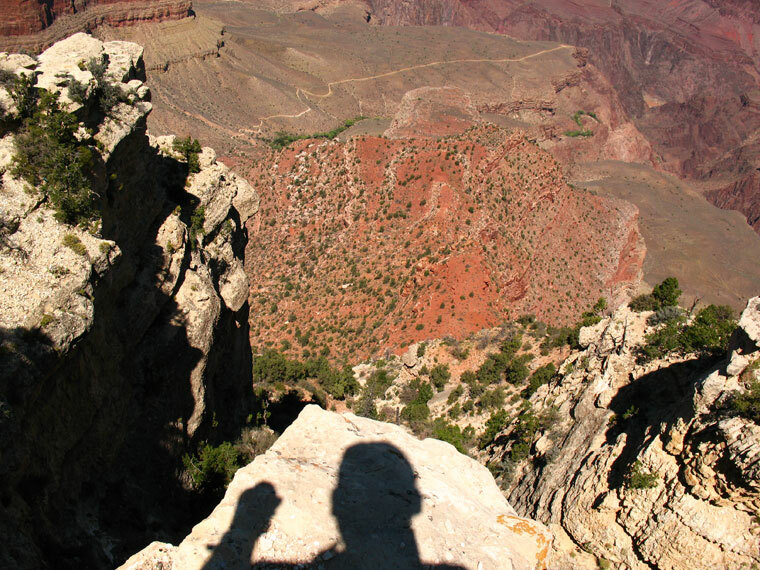 For the rest of the day, no matter where we were on the south rim, I could still see the bright angel trail below, far from noisy tourists, calling me. 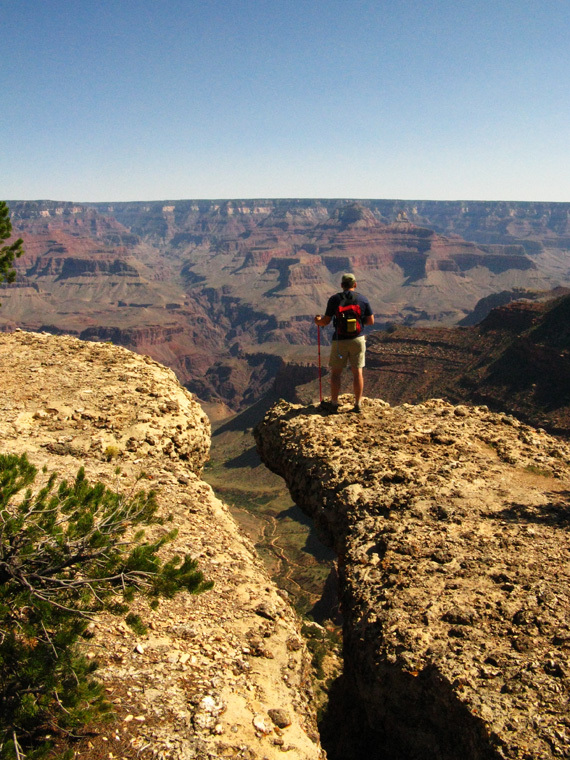 I later added ‘Hike the Bright Angel trail to Phantom Ranch’ to my life list, number 151. 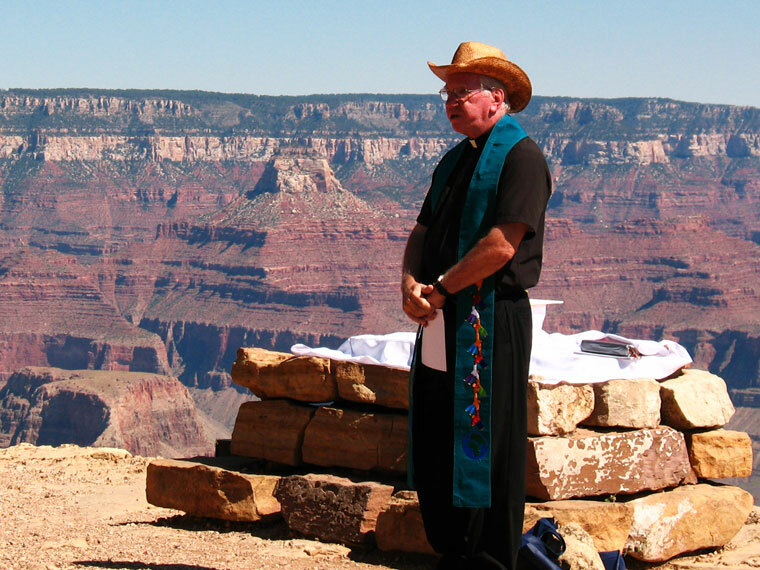 We passed a priest giving a sermon in front of the Grand Canyon backdrop. I couldn’t help but think that in the presence of such a view, a preacher shouldn’t need to tell a religious person about God. It seems you‘re looking too hard, or in the wrong place. In my opinion, the priest would have done them a greater service by silently handing them each a pair of hiking boots. The priest wasn’t the only person to stand out among the tourists. When we weren’t constantly looking toward the canyon and exploring various pillars and ledges, there were plenty of people around to steal our attention. A middle-aged woman dressed in a tight leopard print leotard twisted her body into a Cique De Solei shape as a tall eccentric gray-haired man took her picture. The reptilian part of my brain reacted quick and instinctually saying, “Oh my God Ryan, you gotta get a picture of… whatever the hell is going on here!” My hand went for my camera. Then, the more evolved reasoning part of my brain thought it would be weird and convinced me not to. I didn’t get my picture, but God knows the mental images will forever remain intact. We hiked an easy 10 miles. The crowds were only in areas within a short distance to a parking lot, moving no more than from their car to the rim and back to their car. The further we hiked from parking spots, the fewer people we saw. One man stopped us, pointed to my hiking pole, and asked what it was. I don’t relate to or understand most people. That night, to save time, we loaded anything we didn’t need into the car. We’d be leaving very early for a trip to the Colorado River.